A graphic illustration showing how Makerere University Main Gate will look like upon completion. Courtesy photo. KAMPALA–About 300 solar-powered lights are being installed in the city by Kampala Capital City Authority (KCCA) in a move aimed at lighting the city and fighting crime. KCCA allocated Shs4.4 billion this financial year to cater for this project which also includes installing CCTV cameras a cross the city. The beneficiary areas include Kampala Road Queen’s way Kintu road Bombo road, Katwe, Entebbe road, Jinja road, Nile Avenue and Kiira road. KCCA executive director Jennifer Musisi said the solar lights will ensure security in the city suburbs. She said people involved in murdering Ugandans dump the bodies in dark spots. By importing solar lights, KCCA is moving from using the hydro-power to solar energy, a move which will save the authority from paying high electricity bills. Musisi appealed to city dwellers to refrain from stealing the bulbs. In a related development, KCCA has unveiled the state-of-the- art road and junction in Bwaise and Kawempe city suburbs. For decades, Bwaise has been known for flooding during the rainy season. The road is designed with wide drainage culverts that will help curb flooding by diverting volumes of water to the main drainage channel. The KCCA executive director also revealed that plans are underway to widen Lubigi and Nakamiro drainage channels to ease the flow of storm water. 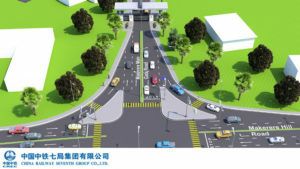 The new infrastructure, among other things, will help improve traffic flow during morning and evening hours, especially cars coming from the Northern by-pass. It is also fitted with walkways to help pedestrians feel safer. Meanwhile, Makerere University, the country’s oldest institution of higher learning, has got a new face, thanks to KCCA’s move to construct nine new roads in the university using the compensation funds secured from government during the implementation of Kampala Institutional and Infrastructure Development Project (KIIDP2) particularly the dualling of Makerere Hill road. These new university roads stretch a total of three kilometers and are constructed by contractors procured by KCCA. Some of the new roads are around University Hall, Mary Stuart Hall, Lumumba Hall, Mitchel Hall, Livingston Hall, and the Institute of Technology. KCCA is also working on the traffic lights at the junction with Makerere Hill road with a major aim of regulating traffic flow.